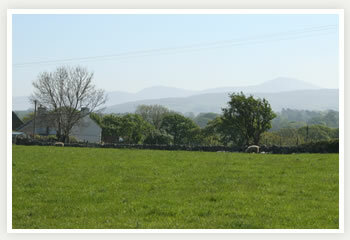 Adjoining property Beudu Cottage, this excellent stone cottage overlooks the town of Caernarfon (2 miles) and across the Menai Straits to Anglesey. It is beautifully furnished and very well-equipped and comprises 2 double bedrooms, a bathroom including hand shower, and a large open-plan kitchen/living room with high beamed ceiling. 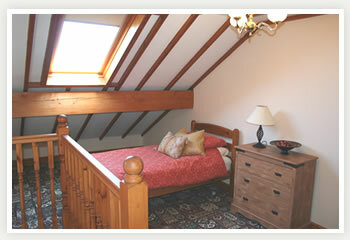 On the first floor gallery is a spacious single bed/sitting room. French doors from the lounge area open on to a verandah with patio furniture, barbecue and fine views to the towers of Caernarfon Castle and beyond. Washer/dryer, dishwasher, microwave, TV, video and heating by night stores. Children's play area and plenty of parking. 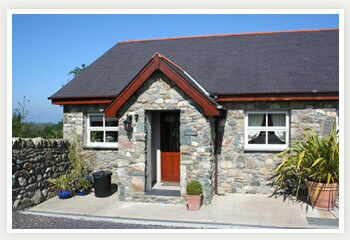 Pub 1 mile and a 15 minute drive to Snowdon or the sandy beach at Dinas Dinlle. One of the clean single bedrooms at Ysgbor Cottage. 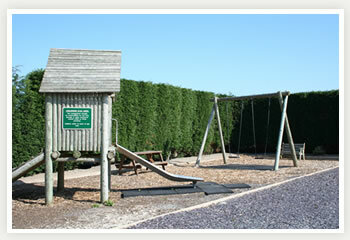 Ysgbor cottage, like all cottages, has access to the Children's Adventure Playground on the site.